Have you ever created an audio dissolve and heard an audible volume dip in the middle of the effect? Perhaps when you’re trying to join two similar pieces of fill? If it’s happened to you, you know how maddening it can be to eliminate. 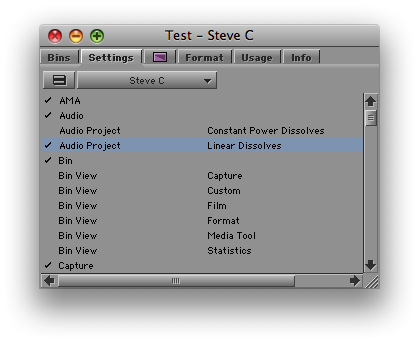 Final Cut offers a neat solution: two kinds of audio dissolves, one of which raises the level in the middle of the effect by 3 db. Audio editing applications typically permit even more choices. It turns out that the Media Composer offers a choice of dissolve types, too. But the feature is hidden in a setting and barely mentioned in the docs. I had thought it altered all dissolves, including the ones you’ve already made. But in fact, it affects new dissolves only; old ones are left alone. The setting is labeled “Dissolve Midpoint Attenuation.” You’ll find it in the Effects tab of the Audio Project settings panel. Similar to Final Cut, your choices are Constant Power, which adds a 3 db boost in the center of the dissolve, and Linear, which is the default. The trouble with this implementation is that it’s hard to quickly alter an existing dissolve and compare options. And you have no indication in the timeline of the type of dissolve you’ve created. FCP allows you to change a dissolve type with a contextual menu pick, and it labels each effect in the timeline. But while not ideal, in practice you can make the MC method work. 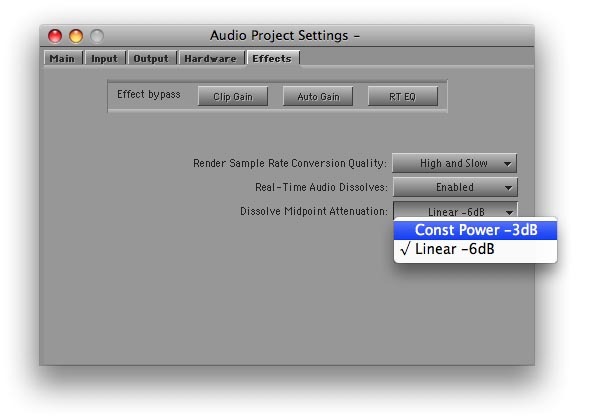 Simply duplicate your Audio Project setting (select it and hit Command-D). Then open each setting by double-clicking, adjust one to be Constant Power and the other Linear, and name them appropriately. Once you’re created these settings, you can quickly switch between them by clicking in the area to the left of the setting name (putting a check mark there). You probably want to let Constant Power be your default. For most dissolves, it’s more likely to produce a smooth transition. For fades, you may prefer the Linear setting. I’m wondering whether readers here have used this feature. It was a new for me and I’m curious whether you’ve tried it and how it’s worked in practice. Please share your impressions in the comments. This entry was posted on January 13, 2010 at 9:50 am and is filed under Audio, Avid, Avid Technical Tips, Avid vs. Final Cut. You can subscribe via RSS 2.0 feed to this post's comments. You can comment below, or link to this permanent URL from your own site. Isn’t this a feature that Walter Murch was adressing as a problem at the last LAFCPUG in December? Indeed, which is what prompted me to investigate further. What a great find and a nice way to implement it. It’s kinda insane that something like this is ‘hidden’ to all extents and purposes, but at least it’s there. Do you know what version it came in on? I’d find that pretty interesting to know. I seem to remember it back in the version 2.8 days, but I’m not exactly sure. Really, that long ago? Just goes to show ya. while I’ve known about this setting, I’ve never actually touched it. Within the last couple of weeks however, fading music often did not give me results I was happy with (I usually do a 60/50 or 100/90 dissolve, and I often felt it faded out rather harshly in the end). I’m wondering whether that might be due to the setting. Gonna try to change it and see what happens. BUT: Will this setting not affect ALL dissolves in the timeline (apart from rendered ones)? I’m pretty sure it will. Kind of a hassle. Christian — you had the same misconception I did. It’s not retroactive. It only affects dissolves you make after the setting is changed. Everything you’ve already created remains as it was. And maybe if I had read your post thoroughly I would have known that – sorry! Now that’s a really nifty trick! Another great post Steve. I’ll be cross-posting this on my site, with a link back to you of course. This feature has been in since Meridian days, and I’ve never futzed with it. Seems to me that check-boxes in the Quick Transition dialog window for each type would be a good feature request. I guess they’d also have to implement a “Dissolve Type” toggle button as well for when you want to add dissolves without using the Quick Transition dialog (e.g. in Trim Mode) . . . Thanks, Benjamin. Good points, all. Looks like very few people have used this feature, even though it’s been around for a long time. Thanks, Steve. More spectacular insight into our editing tool box. I implemented it immediately and I am so glad to know about it. I use this all the time BUT did not know the persistence part of it. That is GREAT info! Thanks for sharing. To bad it is not as flexible as the Avid DS audio tools side of things (basically draw your own curve!! ).